*For the avoidance of doubt, CRO cards issued before October 2015 will remain valid until their expiry date. 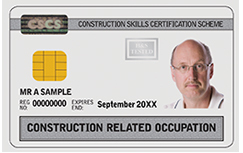 All related occupation cards issued by the following Partner Card Schemes, SKILLcard (Construction Related Occupation), ECS (Related Disciplines), JIB-UK PHMES (Plumbing Related Occupation), will also remain valid until their expiry date. A full list of the Partner Card Schemes is available here.